This is the third in a 5-part series about how buying a diesel vehicle in 2013 resulted in an electric car and renewable solar panels on our house in 2016. If you'd like to read all the parts of this series, you can see them here. 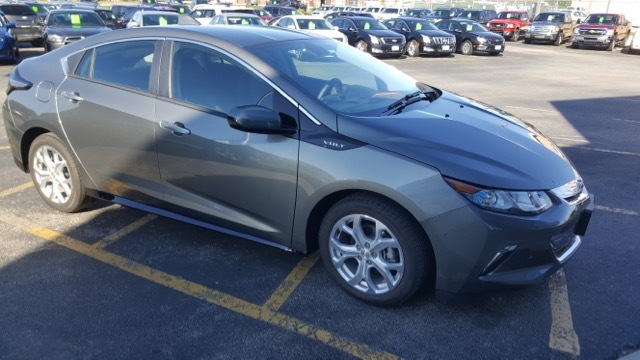 The Chevrolet Volt was high on my want list in 2013, but at that time a new one was running close to $40K, and even after federal tax credits it was just beyond my price comfort zone. At the time, buying used hadn't crossed my mind. Here's your one-paragraph introduction to the Volt. The vehicle operates as a plug-in pure battery electric vehicle until its battery capacity drops to a predetermined threshold from full charge. From there its 1.5-liter internal combustion engine powers an electric generator to extend the vehicle's range as needed. The Volt's regenerative braking contributes to the on-board electricity generation. Under the United States Environmental Protection Agency (EPA), the EV range is 53 miles, and its EPA rated fuel economy in charge-sustaining mode is 42 MPG. Thus, it's like a Toyota Prius in that it's a hybrid electric/gas with regenerative braking and other power saving features. But it's also like a dedicated electric vehicle like the Nissan Leaf or the Tesla in that the drive train is pure electric. The gas engine does not drive the wheels, it powers the battery that drives the wheels. And thanks to the 40-50 mile range, it's entirely possible that except for longer or out of town trips, the average American commuter wouldn't have to put gas in it much at all. Contrary to when I bought the VW, this time buying used was definitely on my mind. I started looking at used Volts. Anything in the 2013-15 range was definitely affordable. If we added a couple thousand dollars to the VW buyback payout, a used 2016 was possible too. Jay and I decided to pursue one. For my birthday in July we test drove a 2015 and a 2016 Volt. The body style change between 2015 and 16 is significant, and the newer model gets about 10 more miles to a charge. We both fell in love with the 2016 during the test drive. The 2016 Chevrolet Volt we bought in late September. I set up a few automated online searches and started getting notified when used Volts came on the market. My uncle, also in the VW buyback situation, was also interested in a Volt, so we talked about our searches. One day he called to tell me he bought one, and that the dealership had a nearly identical twin. I called the dealer but by the time we got in touch, it was already gone. The salesman told me he'd keep me in mind if he got another one in. A few days later he called me about a 2016 with 2,000 miles. I bought it sight unseen. Now, you ask, "What on earth does this have to do with being an urbane farmer?" Nothing really, unless you consider all the things I do as an urban farmer is part of an overall strategy to be sustainable, including care for the earth, people and financial sustainability. Buying an electric car that we will likely put very little gasoline into is sustainable. NOT putting out the nitrous oxide from the VW Golf TDI is sustainable. And powering it with electricity is, well, that's questionable. I've read that while the actual electric vehicle doesn't put out any emissions, that power to move the car is created somewhere. In the midwest it's mostly from burning something, coal or natural gas. There are some wind farms around, but it's still a small portion of the overall power generation portfolio. So, I started to think about how could we power this vehicle in a truly sustainable way. I mean, buy not contributing ANY CO2 to the atmosphere either out of the tailpipe or out of a power plant smokestack. In our house, Jay and I have a saying, "If a project starts with changing a door handle, it will end with a bathroom remodel." True to our saying, selling our Golf and getting a Volt indeed ends up with a the equivalent bathroom remodel. Stay tuned for the next chapter of this mini-series that explains how and why.